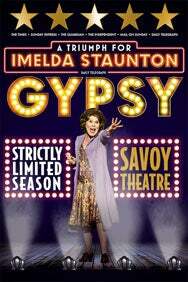 We do not curently have theatre tickets available for Gypsy. This could be because we have simply sold out or it could be that this show is no longer running. The information on this page remains purely for historical and informational purposes. Don't miss Gypsy, one of the greatest ever Broadway musicals, as it transfers to the West End following its sell-out, rapturously acclaimed five-star run at Chichester Festival Theatre. Imelda Staunton delivers a "knock-out performance" (The Independent) as Momma Rose in Jonathan Kent's "dazzling revival" (Mail on Sunday) of this gloriously entertaining musical fable, that features "showstopping" (Mail on Sunday) choreography from Stephen Mear. With lyrics by Stephen Sondheim, book by Arthur Laurents and music by Jule Styne, this moving and "scintillating" (The Times) production of Gypsy is the first to be seen in London for 40 years.